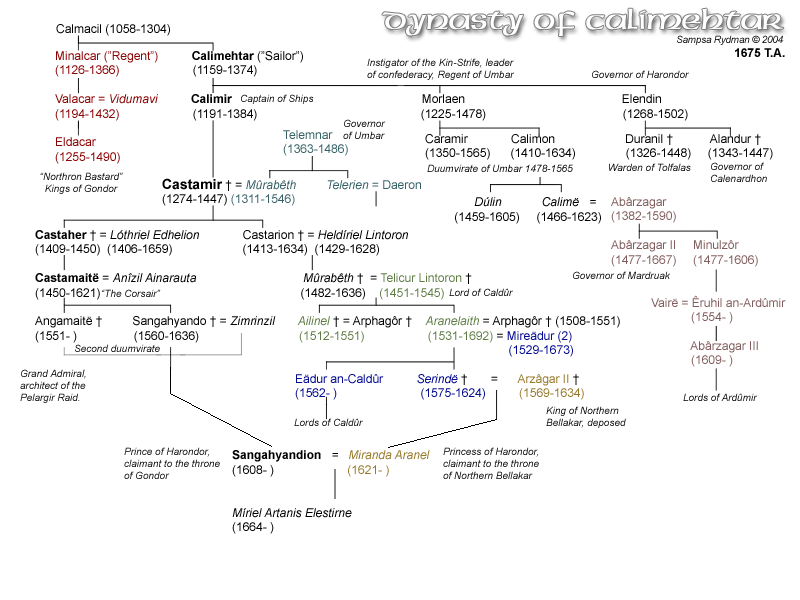 Angamaitë Castamirioni (1551- ) was direct descendant of king Castamir the Usurper and eldest son of the infamous corsair lord Castamaitë. He was by far the most gifted Umbarean politician and a brilliant naval tactician. Cold and calculating, he was also known as a master swordsman with few rivals. It was speculated that he was second only to Curmegil Rúthion, the foremost fencer and master of arms in Gondor under king Tarondor. He is best known as the planner and executor of the Corsairs' Great Raid against Pelargir. On the docks of Pelargir he met and slew king Minardil, avenging his great-grandfather's death at the hand of Eldacar. 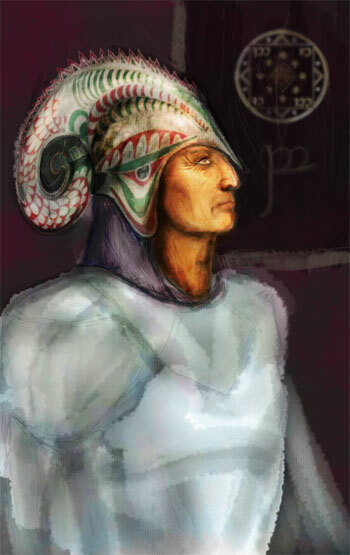 Angamaitë was born as Azrahil in Ramlond (Ad. Abaronlôni) to prince Castamaitë and Anîzil Ainarauta. His father was the grandson of Castamir and head of the exiled royal house of Calimehtar, who styled himself as the "king of the Faithful", though he was never acknowledged as one, neither in Gondor or Umbar. His mother Anîzil was of noble Pelargirean family of Ainarauta who had moved to Umbar with the confederates. To advertise their pedigree the family continued the old royal tradition of assuming official names in high Quenya. Castamaitë named his first son with an old name Angamaitë (Q. "Ironhanded"), which had been Angrod’s second name, just to modify his own. But when his second son was born, he made use of a different rule, and remembering Angamaitë had been the name of Númenórean king Tar-Calmacil’s shield-gauntlet, gave him the name of that king’s legendary sword, Sangahyando. Angamaitë was raised on the tales of his father's sixty-five years of swashbuckling adventures on high seas prior to the war of 1540 . At the first opportunity he went to the sea with his brother and his father's old corsair crew. Together they sailed the world, preying upon the weaker maritime realms and trading their booty at the ones too powerful to challenge. In anonymity, they spend many years preying upon Gondorian shipping and baiting the Gondorian navy until they were called home by their father. With the death of Castamaitë in 1621 he was admitted along with his brother to the Umbarean Council of Captains. He was elected the first judge and asapthubêth of Umbar, a position he retained until 1663 when he stepped down in favour of his nephew Sangahyandion. For eleven years he gathered allies and supporters until he felt secure enough to present his ambitious plan to the Council: A massive raid upon southern Gondor and largest amphibious operation in the annals of Middle-earth after king Ar-Pharazôn landed in Umbar. The success of his plan in 1634 elevated the brothers to the leadership of the Council. Sangahyando was assassinated in 1636, but Angamaitë pressed forward, and in 1636 he became Admiral of the Haven and later the undisputed ruler of the whole principality, a king in all but name, as his house never ceased to point out that they were, in fact, lawful rulers of Gondor. With the control of the fleets and his many political allies, Angamaitë totally dominated the Council of Captains until his old age. This led to stagnation of the Umbarean political life and weakening of the Council, which was unable to unite against growing Gondorian threat after his death. Angamaitë tried to bequeath his powers to Sangahyandion (who was suspected by many to be in fact his own son) and never ceased to hope that Sangahyandion would finally become king of Gondor.